When we moved into our house, autumn was upon us, and many of the plants had started to fade away. The entire year following, I was delighted and surprised by multiple green sprouts appearing in my little bed at the front of our house. Fortunately, my Gamma had come to visit for several months and was able to teach me about the daisies, hostas, and roses blooming before my eyes. The roses thrilled me the most, and while they weren’t the large yellow roses my Papa and Gamma had always had in their garden, they were still a beautiful, bright pink. My Gamma gently warned me that when I cut flowers, I needed to cut them at an angle right above the growth bud, so the stem would continue to grow and produce more flowers. I hadn’t been as cautious about that before, resulting in an awkwardly shaped rose bush on the side of my house. and that there are promises of a better and more fruitful future. It usually results in being very much alone. Most people will shy away from you when you experience pain. My roses needed to be pruned – correctly – in order to continue growing and produce more roses than they otherwise would. 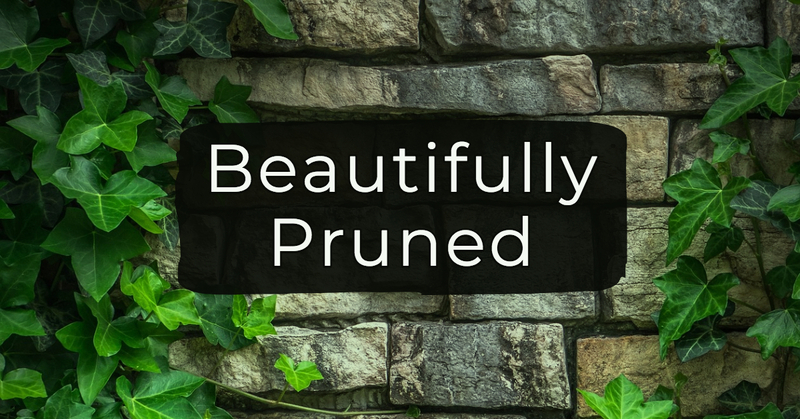 Another word for pruning: sanctification. And ooftah does sanctification hurt sometimes. Oh yes, dear Sisters, it totally is. Because sanctification means that I look more like Jesus and am being used for my intended purpose of bringing glory to Him. Paul talks about both the pain that comes with sanctification, as well as its inestimable value. He actually rejoices because of his suffering (and let me tell you, sanctification happens most during suffering). Paul understands that through this growing, pruning, and maturing process He is being prepared to take new ground for the Kingdom! Paul speaks of proclaiming Jesus’ name and building strong disciples so we may all be fully mature in Christ. This kind of maturity isn’t about physical age, rather it’s characterized by the natural growth that comes from intentional willingness to be consistently discipled by the Holy Spirit. By regularly dwelling with the Lord through Scripture intake, prayer, and living authentically in biblical community, the Spirit strengthens our “inner being” to love Christ and be shaped to mirror Him more and more. Saying yes to Jesus is only the beginning. Surrendering your heart and receiving “Christ Jesus as Lord” will save you for eternity, but if you stop here, you’ve chosen to live far below your birthright in Jesus. 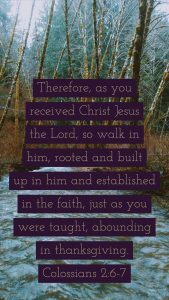 Become rooted, built up, and established in the faith. Say yes to Jesus, and keep saying yes as He prunes your heart and life! makes you keenly aware of truth verses a lie. Paul ached for the Church. He ached for believers to not be stuck drinking milk, but eating solid food. He ached for believers to grow deep and become rooted that they would be able to distinguish between truth and heresy. Heresy ran rampant in the Colossian church, and it does in our culture today too. The only way we will know the difference between what is solid and a deceptive mirage is by renewing our mind through Scripture. We must be…. As you encounter suffering, hold fast to the faith because Jesus is worth it. Give yourself fully to spiritual disciplines, watch the Spirit grow you deeply. Stand firm for truth, and lead others well as you love with grace. “I bless you with the pruning of the Lord. As painful as they are, they are for the best. They come from a wise Father. I bless you with pruning that brings redemption. I bless you with deep, solid, life-giving friendships when you are going through a season of God’s pruning you. I bless you with friendships that are designed, crafted, nurtured, and given to you by your Father, even at the same time that He is taking away other friendships that you have deemed important and necessary to your life. Thanks for joining us today as we journeyed into Anchored Week Two! Don’t miss out on the discussion below – we’d love to hear your thoughts!